AI AND FINTECH: WHAT’S NEXT FOR CANADA ? Home Fintech AI and Fintech: What`s next for Canada`s hottest sectors? AI and Fintech: What`s next for Canada`s hottest sectors? For the past several quarters, AI has been a tremendous source of funding and hype for Canada. 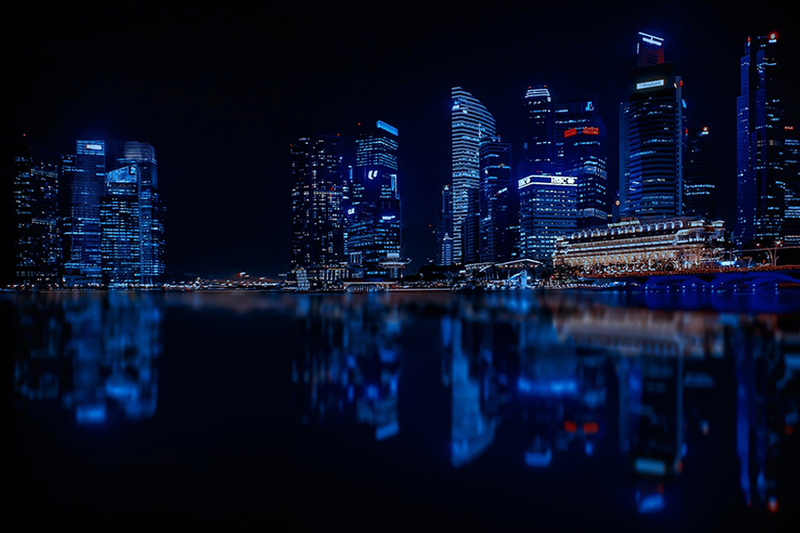 With a federal government directive to invest in Canadian AI and evangelists like Yoshua Bengio and Geoffrey Hinton garnering global acclaim, it’s no wonder that tech companies like Samsung, Microsoft, and Uber have set up shop here. 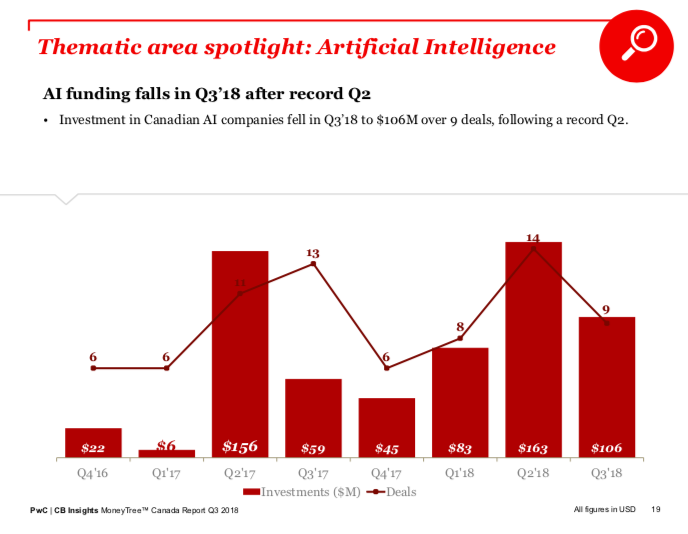 However, last quarter the sector stumbled; according to PwC’s latest MoneyTree report for Q3 2018, AI funding decreased from Q2 2018’s $222 million CAD ($169 million USD) to $138 million CAD ($106 million USD). Part of the reason for the bump in Canadian FinTech interest is regtech. 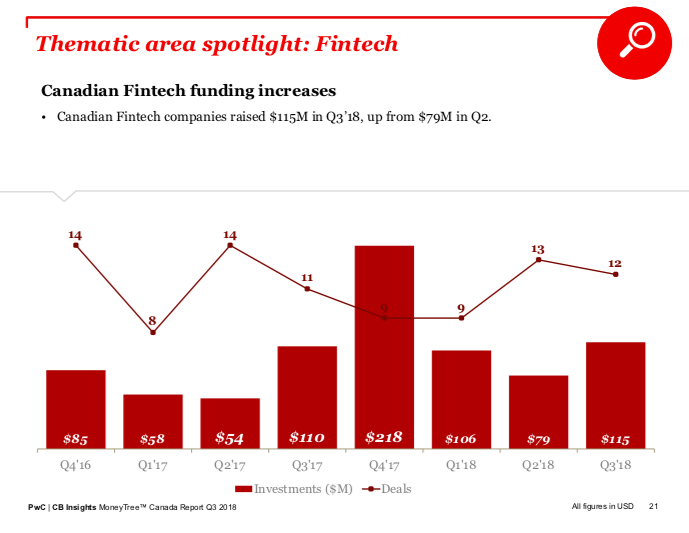 In comparison, FinTech boasted $150 million CAD ($115 million USD) in funding, a 31 percent increase from the previous quarter. FinTech has traditionally been one of Canada’s strongest sectors, though AI mega-rounds from companies like Element AI and Coveo have stolen its spotlight. As the year wraps up, where are these these two sectors—which have both been among the most attractive for VCs—headed in 2019? Speaking with BetaKit, PwC’s Michael Dingle attributed the AI decline both to an absence of mega-rounds this quarter, as well as the evolving nature of the AI industry. Dingle told BetaKit that, once the data in past quarters was normalized for the mega-deals, Q2 2018 drops down to $82 million ($63 million USD), and Q2 2017 drops down to $70 million ($54 million), making Q3 2018’s $138 million ($106 million USD) comparatively healthy activity. “The growth of Canadian venture-backed AI companies began four to five years ago and caught fire in the last couple of years,” he said. As Dingle indicated in BetaKit’s first report on Q3 2018, AI businesses that were previously focused on technology are now in the process of commercializing: talking to their client bases to figure out how foundational AI technology like natural language processing can solve problems in existing businesses. That process requires evolving from ‘horizontal AI,’ which Dingle indicated includes large teams with general AI expertise, towards ‘verticalized AI,’ which include full-stack AI businesses delivering more targeted solutions more targeted to specific industries. As Dingle put it, AI is becoming the core value, rather than the “proverbial sidecar.” In the past year, the sector has seen companies like Layer 6 acquired by TD to work on healthcare solutions, and Element AI finally indicating how it will use its proprietary research to launch new products. While AI may just getting started, FinTech activity is ramping up in tandem with regulations changing around the world. Part of the reason for a bump in FinTech interest is regtech; in the wake of GDPR and increased consumer concern for privacy and data, startups are stepping in to help enterprises navigate compliance. At the same time, governments are re-examining regulations to make small businesses more competitive, one of the most notable being the UK’s recent open banking law meant to increase competition in the financial sector. Artificial intelligence as a technology is set to transform most, if not all, industries, and FinTech is no exception. Lassonde said FinTech generates massive amounts of data from transactions, mortgages, and other financial activity every year, which provides more opportunities for an intersection between the two. With AI now finding its footing in a similar way to FinTech several years ago, Lassonde speculated that we could be on our way to a FinTech unicorn. The VC also agreed broadly with Dingle that, in the next few years, the tech industry won’t be talking about companies as AI companies. “Ultimately, machine learning is simply a piece of technology, and companies live or die on whether or not they have a viable business, and you don’t have a viable business because you’re using machine learning or not,” Lassonde said. “The best businesses will be ones that use all tools that are available to them in the best possible situation. We’re going to have complex capital markets systems that have a combination of machine learning for what time of day I should make an investment but may actually use program logic on what I should be trading.